Most of the cycling infrastructure I show you on this blog has been tried and tested for years, usually even decades. Today is different. 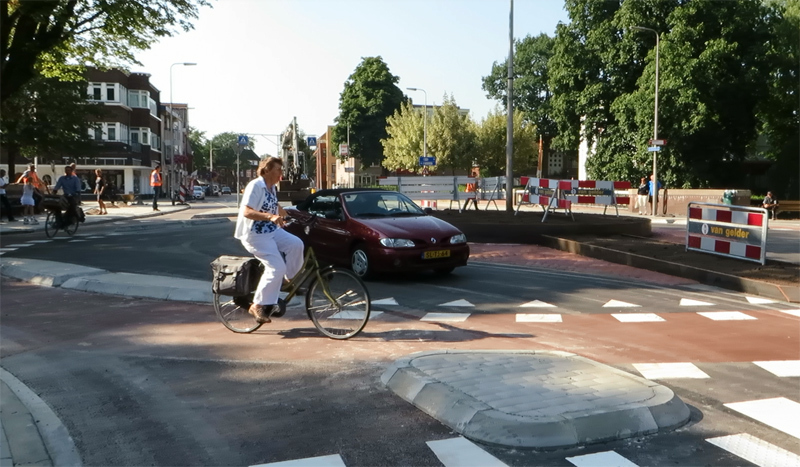 Zwolle has built a piece of cycling infrastructure that is a first even for the Netherlands. An experimental and innovative roundabout for cyclists that is at the same time not a roundabout for motorists. In Dutch it is called a “Fietsrotonde” or ‘Bicycle Roundabout’. It was opened last Friday afternoon, 23rd of August 2013. Zwolle has a policy of separating cycle traffic and motor traffic on route level. Most of the time the two types of traffic follow an entirely different route and that eliminates most of the interactions. But inevitably the two types of traffic are going to meet somewhere. Where an important cycle route had to cross the inner-city ring, the flow of motor traffic had gotten the priority. But that led to long waiting times for the many people cycling. 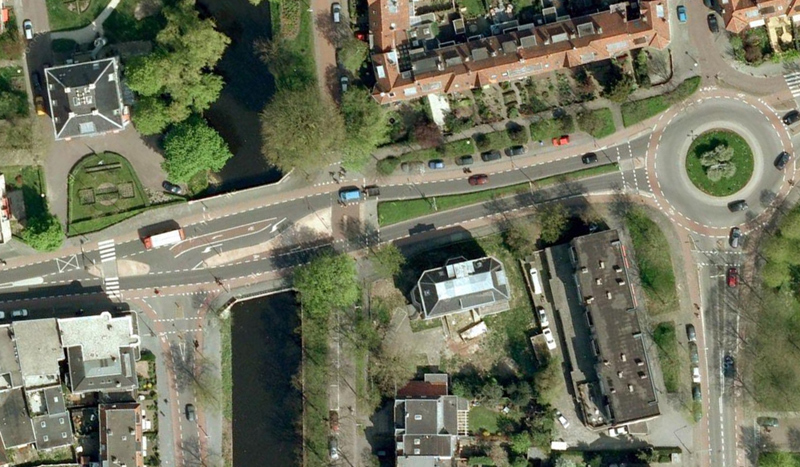 The city of Zwolle tried to find a better solution for this troublesome crossing. In a video (in Dutch) the city explains how they handled this project. In the before situation cyclists crossing the main route for motor traffic had to wait for a gap in traffic before they could cross the road. After the reconstruction motor traffic has to give cyclists priority on the ’roundabout’. Project leader Ilse Bloemhof and designer Marieke van Brussel of the municipality of Zwolle had meetings with a wide range of stake holders like the society for a safer traffic in the Netherlands (Veilig Verkeer Nederland), the police, a lorry driver, the local branch of the Cyclists’ Union (Fietsersbond), representatives of nearby schools and people living in close proximity of the junction. The before situation shows the crossing was close to an existing standard roundabout (right). Note that all the streets already had cycling infrastructure (mostly cycle lanes). The design of the bicycle roundabout. It is clearly much smaller than the standard roundabout to the right. The dark grey part in the centre of the bicycle roundabout can be driven over by (larger) motor vehicles so the curves are not too tight. The green barrier in the centre of the roundabout prevents motor traffic from turning left. The budget for the roundabout was 500,000 euros and it was in part financed by the province. The rest was paid for by the municipality. It is important to make clear that this roundabout is of a different and much tighter size than usual. This smaller size had to be tested thoroughly and the roundabout was set up live size on a test area to see if a big lorry (the measure of things for a roundabout like this) could safely navigate it. The project leader sat behind the wheel of a lorry herself to test if she could see the people on bicycles. She was also present in the final hour before the actual opening, handing out refreshments to the workers who had to work really hard to finish the last details in time. The first tweets of people who navigated the roundabout were very positive. I must say I was a bit sceptical myself of the need for a new design. But after seeing it and actually riding on the roundabout I am really positive too. 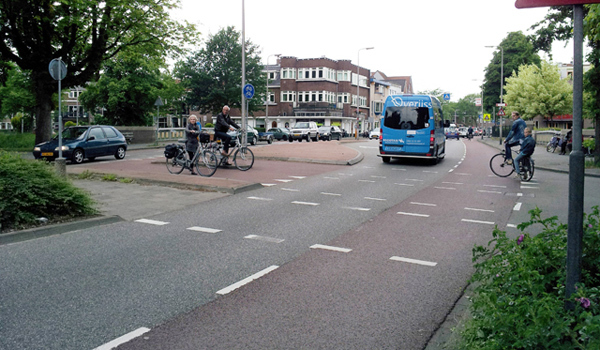 Especially because it is so easily understood in the Dutch situation where this type of roundabout is common. For that reason I do think this would only work in the Netherlands, simply because we have 20 years of experience with these roundabouts with priority for cyclists. If you don’t have that, this design would not be so easily understood by all traffic users. It is hoped that the flow of motor traffic is not interrupted too much by the (many) cyclists. But since there is another roundabout nearby the cars already flow in a pace that makes it easy to take turns. On Dutch roundabouts it is common that people pass each other really ‘close’ and that people will even adjust their speed slightly so they can really take turns. I showed this earlier with the roundabout in the centre of Amsterdam and the video below already shows that phenomenon starting to happen here too even in the first minutes after the opening. 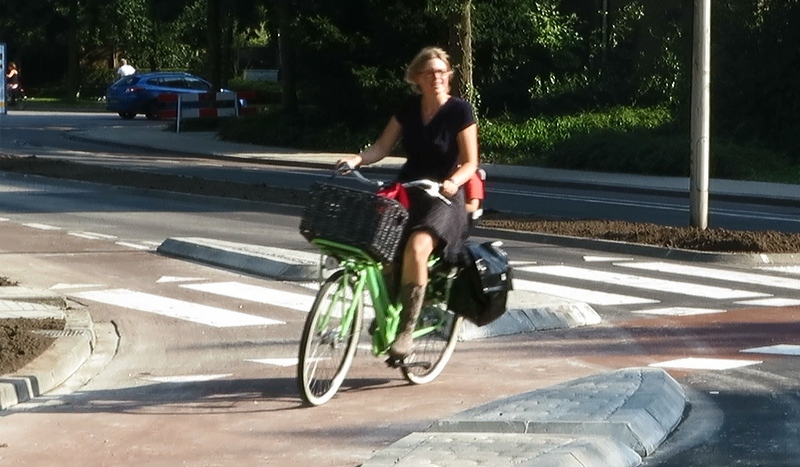 Designer Marieke van Brussel rides ‘her’ cycle roundabout in the first hour after the opening. In the first hour after the roundabout was opened, the designer herself could be seen cycling around it. On a sturdy sit-up bike with a basket on the front, panniers and her young child in a seat at the back. No wonder she designs something that is good for cyclists, when she can be seen cycling like that herself! On Monday morning the fist rush hour will be the big test for this roundabout. Hopefully both traffic flows will be able to cross each other’s paths smoothly. The Overveen crossing (a “Mock-roundabout?) is OK for cyclists, but confusing for motorists. If they want to go straight South to North while under the impression this is a roundabout they will end up at the traffic island… The funny thing is that a bit further South there is a real roundabout (crossing Oosterduinweg and Zandvoortseweg) that motorists coming from Zandvoort often misinterpret as being a normal crossing, which is a problem if you pass there North to South either as a motorist or a cyclist (often you would not get priority). Another point both for the Zwolle and the Overveen crossings: obviously, a roundabout sign is not there; might this not clash with the perception of especially motorists based on the road design? Thank you for the information and comments. I wish we had at least a fraction bike suitable infrastrucuture that you have. Hope you don’t mind, I have reblooged this article. If that’s not OK, let me know and I’ll remove it. Wieder eine gute Idee aus Holland. Large roundabouts are uncommon in the U.S. The city of Los Angeles is going to start installing mini traffic circles or mini roundabouts for traffic calming and to reduce the number of stop signs that a bicyclist would encounter on streets that have less than 2,000 motor vehicles a day. A one mile length of residential street could have as many as 16 intersections where you would encounter a stop sign. A key difference between this application and the experimental design in Zwolle is that the bicyclist will be in mixed traffic. Page 59 mentions advantages and disadvantages. However, its not clear to me that having a bicyclist riding in mixed traffic on a mini roundabout is a safety improvement over intersections with stop signs. I rode numerous times on a mini roundabout in mixed traffic when I was a willing guinea pig for the Los Angeles Department of Transportation tests to see how effective sharrows were to determine whether they would use them. Several of us were sent out one at a time for several peak hours during the morning and afternoon in a circular route riding bikes at a steady 12 mph along a residential street where the sharrows would be installed when a car was approaching and the interaction was filmed as we rode before and after the sharrows installation. I didn’t notice the cars slowing down noticeably when I was followed into the mini roundabout towards the end of the test route. In fact I was relieved to loose the motor vehicles at half way through the roundabout where I was instructed to turn right–which was the end of every test run. This was one of six locations that we did before and after sharrows installation test runs. The location where the center of the sharrows would be installed was 12 feet away from the curb. It was required that sharrows had to be placed where there would be parked cars and the posted speed limit could not be more than 35 mph. In California the posted speed limit is determined by finding out what speed 85 percent of the drivers are moving at. That’s right, the drivers are in effect setting their own speed limit. By law, this average speed has to be determined and updated about every three years in order to give drivers a ticket for speeding that was measured using a microwave or laser gun. The posted speed limit along a arterial street in the west San Fernando Valley section of Los Angeles can be 50 mph. There is a street which I rode daily in a bike lane on my way to work that has a posted speed limit this high. The freeway speed limit is 55 mph in the Los Angeles area. The sharrows tests had results of several drivers honking, or yelling at us. During one of my test runs on a street that had a posted speed limit of 35 mph a police car got behind me and through his intercom told me to get in the bike lane. There was no bike lane, but I must have looked like a jerk because there was no longer any cars parked and I was riding twelve feet away from the curb towards the middle of the moving lane. The officer was essentially telling me to move towards the side of the road to get out of the way of motor vehicles. A number of comments are about signalling. The rules for signalling on a roundabout are apparently unclear to people, which is not so strange, because the rules changed when the roundabouts changed in the 1990s. For a lot of people that was after they already had their license. In the old situation you would use your left signal when you entered the roundabout to go ¾ around the roundabout (a left turn) and your right signal if you went 1/4 (a right turn). But on the new roundabouts it is different. If you are on the roundabout you are considered to go straight on. So only when you leave the roundabout you turn on your right signal. In that analogy cyclists riding on the roundabout and continuing would not have to signal. The only time you need to stick out your right hand is when you leave the roundabout. That means that if a cyclist does not signal a motorist must wait because the cyclists would then normally not leave the roundabout. Some commenters seem to think cyclists should use their left hand to indicate they will stay on the roundabout, but that is not the case. Yes, some people do indicate they will continue to stay on the roundabout, but that is only out of courtesy. It is not necessary. Thanks Mark, I am indeed one of those people who never bothered to investigate the new roundabout rules for cyclists. I know it’s like that for cars, so why not for cyclists as well? Just never thought of that. Well, I agree both with you AND with those who call for signalling: Signalling [i[left[/i] is not necessary, but it would be good if the cyclists on the roundabout would sign [i]right[/i]. This would avoid cases such as on 3:38 where the car driver slows down to give priority to cyclists who do not intend to cross his way anyway. Like I’ve said before: I doubt if it will avoid most of those situations, because it’s very hard for a car to see the signalling to the right. Or try to interpret the signals of 2 cyclists next to each other, where one indicates a right turn. In addition to that, you have smokers, cellphone users and people riding all the time with one or no hands at the handlebars, which are even more difficult to interpret. Especially flicking the ash of a cigarette or flicking the cigarette away is hard to distinguish from a turn-right signal. And when the car doesn’t notice or is in doubt, he will rather be safe then sorry and still stop. Only when there’s a single cyclist clearly indicating a right turn, it will help. Sensational. A roundabout where bicycles have priority. Just after one where vehicles have priority. Only in the enlightened Netherlands. You are just lightyears ahead and not slowing down. This blog is an absolute joy to read. Keep up the excellent work and well done the Netherlands for showing us all the way. To be clear: on the other roundabout cyclists also have priority. That is the standard for a roundabout in the built up area in the Netherlands. That is why this design is so easily understood: it works exactly the same as a standard roundabout, the only difference is that it is impossible for motor traffic to turn left. 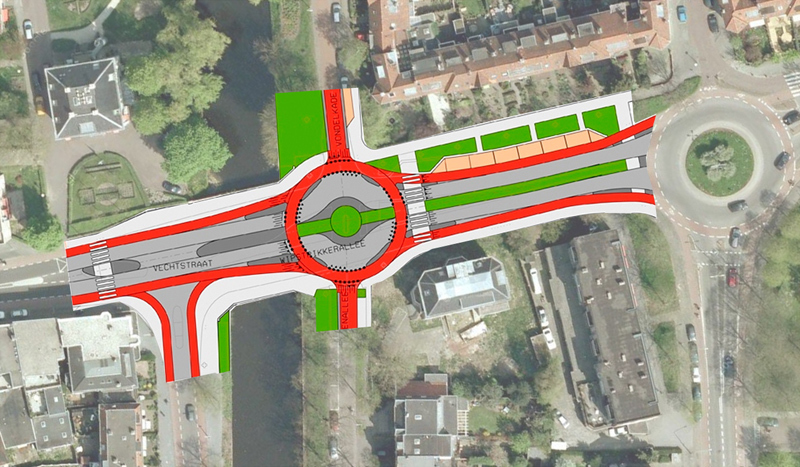 That roundabout with cycle lanes could probably use an upgrade (so could most of Zwolle’s cycle lane roundabouts) to put at least a small median between the bikes and cars, just enough to keep cyclists safe on roundabouts in the limited space. Zwolle also probably needs an upgrade of most cycle lanes to cycle paths, changing existing intersections to roundabouts as much as possible, simultaneous green when bicycle turning volumes are high enough and so cyclists get at least two green stages with a maximum wait time of 30 seconds, and the “protected intersection” elsewhere with traffic lights, with waiting time indicators. Oh, and Grade separating cyclists from dual carriageway roads, IE the city main ring road, and other main intersections too. Angle the curbs and make them red, and I think Zwolle really would be best cycle city of the Netherlands. Signalling? Bikes have priority here, so drivers should always expect that they might move make a left… yes? In other words, bicycle priority is an absolute, but some people might signal and some people might not, and you might not see it anyway. Do I understand this correctly? Having priority is one, taking it is another. To keep annoyance levels low, signalling is preferred. But if there is confusion, there will be more room for error. So I’m convinced it’s best to make the cyclist’s intentions clear. I’ve been thinking the same thing as André Engels below: perhaps it’s best to define that clarity by design of the roundabout itself. If straight-on is further away, then the intentions of a cyclist taking a left turn suddenly becomes clear to drivers. This could be supported by a left-turn lane. But perhaps my reservations are premature and this works out fine in practice. I think Koen means this: http://goo.gl/maps/z1oBy in that case it is much sooner clear that cyclists are going to leave the roundabout when they take the lane to leave it. But this takes a lot of space! Oh, yes, the cyclist is! 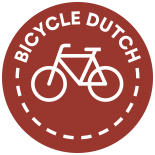 In dutch law, it’s not allowed to create (potentially) dangerous situations on the road, or to maneuver yourself in a position where you are at risk. So everybody is required to pay attention all the time, and should take responsibility to avoid accidents. The car-driver is (in this situation) required to yield, but that doesn’t mean that the cyclist can claim ‘right of way’. If the car driver doesn’t yield, the cyclist is still required to stop. If the cyclists cannot stop in time, he is at fault for that. In reality, when it would come to an accident, the car driver will usually be held fully responsible in civil law. But in criminal law, the poor cyclist could potentially still get fined after being hit by a car (though the fine for the car driver will likely be substantially higher). I like it. One of the main tenets behind Sustainable Safety is “recognisability”, the idea that you should be able to work out what to do based on a limited number of recognisable situations. This pseudo-roundabout might be new, but it resembles a situation that most road users are very familliar with. I like this design a lot! I think it could use a sign telling cyclists to make sure they signal their direction. At times it’s not very clear if they go straight on or turn left. That could lead to collisions. Just as in other roundabouts of course, but to my idea here the driver will be focused on driving straight on a lot more. I like the idea though. In my experience, there is a huge discrepancy between the number of cyclists that signal their direction, and the perceived ‘signalling rate’ by car drivers. Problem is that it’s quite hard for a car to see the bike signalling, especially when the bike signals going right while at the right side of the car. In most cases, cues from speed and direction are easier to interpret. I don’t say that signalling shouldn’t be done, but at slow speeds, mutual understanding will arise even without. The cyclist looking over their left shoulder when staying on the roundabout is a big cue, and one I try to give when cycling. A cyclist about to leave the roundabout would not bother looking over their shoulder. Perhaps this could also be solved in the design of the roundabout? Make the circle wider, and move the point where the cyclists turning to the street split off from the roundabout away from the motor road. Even better, replace the miniature roundabout shape in the motorway by a slight S-shaped turn, strengthening that effect. Could become a new crossing-type altogether…. This entry was posted on 26 August 2013 by Bicycle Dutch in Original posts and tagged exceptional cycling infrastructure, roundabout, Zwolle.